In November 2015, Dr Fred Bergman, President of the DGOI, and Dr Paul Weigl, Chairman of the DGOI, were the guests of honour at an international symposium in Kiev, Ukraine. During this event, the Ukrainian Association of Oral Implantology was founded and will be a new partner organization of the DGOI. Oral implant education and training for dentists with the objective to implement improved dental standards is an international commitment of the DGOI. Among others, this was one of the issues of the symposium in Kiev. On this occasion, Dr Fred Bergmann and Dr Paul Weigl talked to representatives of the Ukrainian Ministry of Healthcare and the P.L. Shupyk National Medical Academy of Postgraduate Education about how to systematically improve the oral health of the Ukrainian population. One step into the future is already taken: the foundation of the Ukrainian Association of Oral Implantology with the support of the DGOI. The new organization will implement the Curriculum Implantology “8+1” of the DGOI in Ukraine. 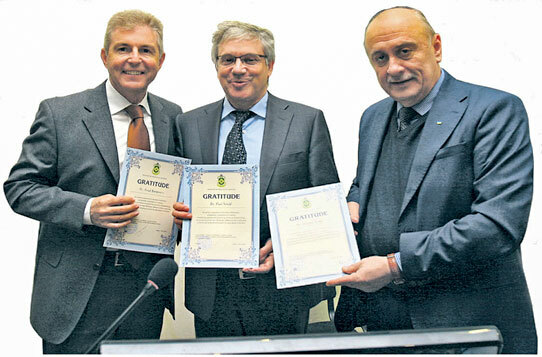 Alexandr Polowtsew, Director of the A. Pawlenko Institute of Dentistry, handed over the certificates of recognition to the guests of honour, Dr Fred Bergmann and Dr Paul Weigl.